Annie Etheridge is one of at least four women who are known to have received the Kearny Cross. And, although she never actually enlisted in the army (serving as a volunteer field nurse or “vivandiere”), she is frequently described as one of the very few female private citizens who received a pension for her service to the army. Until now, however, no strong evidence had been produced that she actually received such a pension. 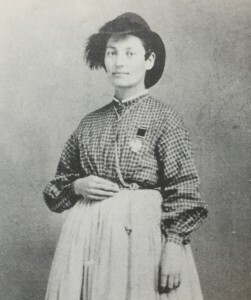 Much has been written about Annie Etheridge (née Blair), whose husband, James Etheridge, enlisted with the 2nd Michigan Infantry during the Civil War. Annie followed the regiment (and subsequently the 3rd and 5th Michigan Infantries) throughout their service, tending to the wounded in the field and often being exposed to live fire. She was wounded at least once, reportedly had two horses shot out from under her, and her dress was often described as being “riddled with bullets.” And yet “Gentle Annie,” as she was known by the many men in her Division who loved and respected her, never received any compensation for her service. As evidence of the attempts to obtain a pension for Annie Etheridge (who by 1870 had divorced James Etheridge and married Charles E. Hooks), researchers often cite newspaper articles or quote from reports of the Committee on Pensions in the U.S. Senate and House of Representatives where her fate was debated*. But proof that the pension was actually granted has proved more elusive. In the 1886 discussion in the House of Representatives, Annie is described as “poor and needy,” having “never recovered from the results of her long and arduous service.” While she originally requested a pension of $50 per month, the final award of $25 per month (about $663 in today’s money) no doubt came as some relief to her in the last quarter century of her life. Annie died in 1913 at the age of 73. 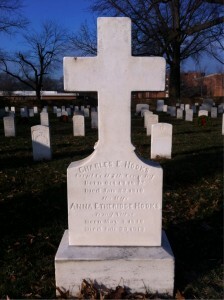 She is buried with her husband, Corporal Charles E. Hooks, in Arlington National Cemetery (Section 15, Lot 701). * The U. S. Senate report of the Committee on Pensions, 49th Congress, First Session, Report #1544, 22 July 1886. The U. S. Senate report of the Committee on Pensions (revised), 49th Congress, First Session, Report #1599, 30 July 1886. The U. S. House of Representatives report of the Committee on Pensions, 49th Congress, Second Session, Report #3763, 26 January 1887. ** “An Act Granting a Pension to Mrs. Anna Etheridge Hooks”, Ch. 155, 24 Stat., 903 (1887).